With just one round left in the FIDE Grand Prix series, we have the same favorites we’ve had for a while. However things are not yet entirely final! While Fabiano Caruana and Hikaru Nakamura each have roughly a 90% chance of emerging from this final round in the top two of the overall Grand Prix standings, which would earn them berths in the 2016 Candidates Tournament, they both still face some danger. Jakovenko picked up a critical win in round 10, setting up a huge showdown with Nakamura in the final round, and keeping his chances alive. There are also a few crazy scenarios where Tomashevsky remains alive as well… and believe it or not it’s even possibility where Jakovenko and Tomashevsky both qualify, ahead of Caruana or Nakamura. So then, let’s talk scenarios. First we’ll look at the most critical game, Nakamura-Jakovenko. If this game ends decisively, things are (mostly) clear. Should Nakamura win (which we expect to happen 36% of the time), then Nakamura and Caruana will be the top two. Order will depend on Caruana’s result, but they will be the two Candidates. On the other hand, if Jakovenko pulls the upset with the black pieces (which we expect to happen 12% of the time), then Jakovenko and Caruana will be the two qualifiers, except in one crazy absurd scenario we’ll discuss later. So Caruana should be rooting for a decisive result – he wants to see fireworks on the board between his two rivals. If either of them wins, then Fabiano is almost guaranteed a top-two finish and Candidates berth (even if he loses his own game). On the other hand, if Nakamura and Tomashevsky draw (which, sadly for Caruana, is the most likely possibility at 52%) then things are murkier. The draw would be good for Nakamura, who would qualify 99.8% of the time. His only danger is if Caruana, Tomashevsky, Gelfand, and Dominguez all win their games. Credit to Colin McGourty at chess24.com for identifying that scenario. With a draw between Naka and Jakovenko, though, Caruana would drop to an 86.3% chance of a top two finish, Jakovenko would be at 13.4%, and Tomashevsky would be alive at 0.5%. The second critical game is Giri-Caruana. We give Giri a 21% chance of winning, which is all that really matters. If Caruana wins or draws, he guarantees himself one of the two Candidates berths; all his danger comes in scenarios where he loses. Also in the case of a Nakamura draw, a win or draw by Caruana completely clarifies matters: Nakamura and Caruana would get the two spots. The crazy possibilities come into play in roughly 11% of all cases: when Nakamura and Jakovenko draw and then Caruana also loses! Those various scenarios are rare enough, and varied enough, that it seems most convenient at this point to start looking at it from each individual player’s perspective. If your mind has melted at all the “if” and “unless” nonsense above, take a moment to refresh and we’ll start over from a new angle. Fabiano Caruana: 92.6% chance of qualifying. Caruana has the black pieces against Anish Giri. If he wins or draws his game, he guarantees himself a top-two finish. If he loses, then he should root for a decisive result in Nakamura-Jakovenko, in which case he’ll still qualify 99.8% of the time. His worst case scenario is to lose, and for Nakamura and Jakovenko to draw. Then the other four games would all start to matter, and Caruana would have roughly a 32% chance to qualify, depending on how those games worked out for him. Hikaru Nakamura: 87.6% chance of qualifying. Nakamura faces Jakovenko in the most critical game of the day. Any decisive result is clear, as we explained before. If Nakmura wins, he’s in (and Caruana is too). If Nakamura loses he’s out. With a draw, he’s also basically safe, except for one weird (and very unlikely) scenario we talked about earlier. Basically, he controls his own destiny and will have no real need to worry about other games. Just don’t lose, and he qualifies for the Candidates. Dmitry Jakovenko: 19.5% chance of qualifying. Jakovenko is on the flip side of the key game. He also has a simple “win and in” spot, but beating the 4th highest rated player in the world is always a tough task – especially with the black pieces. The good news is that even if he doesn’t manage to win, a draw still leaves him alive (his chances only drop to around 13.5% if he fails to win). He would need Caruana to lose, and then would also need some additional help in the other games. 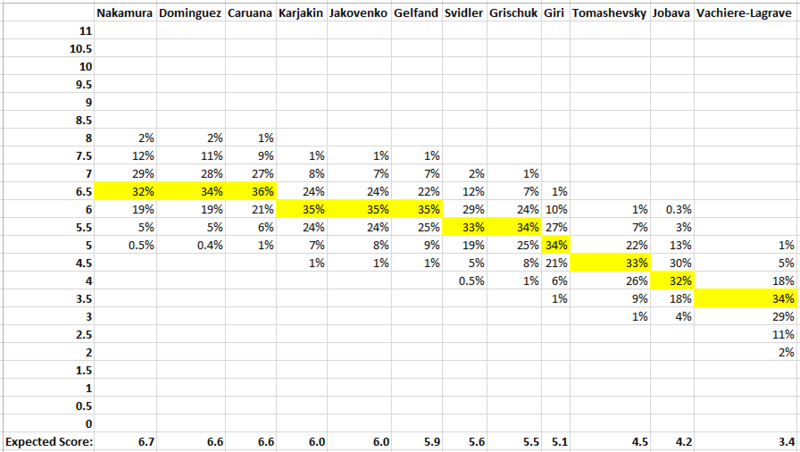 Ultimately if Jakovenko draws but then Caruana loses, Dmitry will qualify about 67% of the time. Evgeny “I’m Not Dead Yet” Tomashevsky: 0.3% chance of qualifying. And then we have the dark horse. First of all, to have any hope of earning a Candidates berth, Tomashevsky must of course win his game (with white, against last place Vachiere-Lagrave). Even with a win, Tomashevsky needs a ton of help. Interestingly the results of Caruana’s game and the huge Nakamura-Jakovenko game make little difference to him. If Tomashevsky wins his own game, his rooting interest lies with Gelfand and Dominguez. In fact both of those players must win their games to keep Tomashevsky alive at all! The reason it matters is that by moving up in the standings, those two players would be able to limit the points earned by the other contenders near the top of the field. A loss, or even a draw, from any of Tomashevsky, Gelfand, or Dominguez is enough to eliminate Tomashevsky’s slim hopes. If all three of them win, though, his chances jump up to the 29% range! There is one particularly crazy scenario we need to look closely at, now. We’ve hinted at it a few times already. It requires specific results in all 6 games of the round, but there is a way for Jakovenko and Tomashevsky both to qualify, while leaving Caruana and Nakamura both outside of the top two. What is this madness? To begin with, Tomashevsky must win and Jakovenko must defeat Nakamura (clinching one of the two Candidates spots for Jakovenko). Of course Caruana would have to lose in order to keep that second spot open. Then Dominguez and Gelfand would each have to win their games, as with any pro Tomashevsky scenario, which would be enough to move those two into a tie for second place, behind Jakovenko but (critically) ahead of Nakamura and Caruana. Nakamura and Caruana would finish tied for 4th-6th place with Giri, and each earn 80 Grand Prix points, putting Caruana’s score at 310. Finally, Jobava would have to win or draw his game against Svidler, so that Tomashevsky manages to finish alone in 7th place (instead of tying with Svidler for 7th-8th), which would get Tomashevsky 60 Grand Prix points bringing his overall total to 312, and sliding him into second place by the slimmest of margins! By our calculations, this result should happen about 1/5500 times (which is to say there is a 0.02% chance). Wouldn’t that be something? Remember that this final round starts an hour earlier than the previous rounds did: at 14:00 local time, otherwise known as 2 AM for me. Yes, sorry, I’m whining. Time zones are inconvenient when trying to follow events happening on the other side of the world. If you live elsewhere, though, and want to watch all the chaos live, I encourage you to do so! Don’t miss the openings by not knowing the slight change to the schedule, and enjoy! Nakamura’s huge run continued today. Not only did he win his second consecutive game (so much for our earlier complaints that he was drawing too much!) but he also benefited from an upset victory by Jakovenko over Caruana. Nakamura is now tied with Caruana and Dominguez for first place at Khanty-Mansiysk, and if the tournament ended today would earn 140 Grand Prix points for his efforts, enough for a comfortable second place finish in the final standings (behind Caruana) and a berth in the 2016 Candidates Tournament. On the other hand, nothing is decided yet. While the picture is finally clear in the sense of having two obvious favorites, rather than three or more players with similar chances, the number “100%” doesn’t show up in any column. There’s still roughly a one in four chance that Nakamura fails to qualify, and several long shots who could potentially overtake him in the final three rounds. I find it interesting to note that Jakovenko and Gelfand both have better chances of qualifying for the Candidates now than they did when this tournament began. Jakovenko’s 11% chance, for instance, certainly can’t be ignored. Much stranger things have happened. Notice that all three co-leaders are expected to earn, on average, fewer Grand Prix points than they currently stand to pick up. This is because maintaining a lead is fundamentally difficult. You don’t just have to outperform one player behind you (which you might be a favorite to do), you must avoid being passed in the standings by ANY of the players behind you. Seldom would anyone be favored to outperform the entire field – perhaps excepting Magnus Carlsen who is not a part of this event. After the rest day, round 9 will be played on Sunday. Caruana will have the black pieces against Karjakin as he tries to hold on to his place atop the Grand Prix standings. Our other leader in the current projections, Nakamura, will have white against Grischuk. That game, Nakamura – Grischuk, presents an interesting scenario (first brought to my attention by Martin Bennedick, @bennedik on Twitter) where it’s possible that Grischuk’s overall odds of qualifying for the Candidates Tournament could possibly be highest if he LOSES this game. To understand why, we must remember that the Grand Prix will determine only two of the eventual eight players in that field. Two other Candidates will be the players with the highest average rating across all 12 rating lists from 2015 who did NOT already qualify in another manner. Right now that average ratings list shows potential qualifiers as 1. Caruana; 2. Topalov; 3. Nakamura; 4. Grischuk; 5. Kramnik. This means that as it stands right now, if Caruana and Nakamura both qualify via the Grand Prix, Grischuk moves up to second on the list and becomes a projected Candidate (which he currently is not). If Caruana and, say, Tomashevsky finish top two in the Grand Prix, then Topalov and Nakamura would get in by ratings and Grischuk would be left out. So how much could Grischuk help Nakamura’s chances by losing that game? We estimate Nakamura at 76% to finish in the top two as it stands, but if we assume a Nakamura win over Grischuk while keeping everything else random, those odds climb to 93%! On the other hand, if Grischuk were to shoot himself in the foot and beat Nakamura, Naka’s chances would plummet to roughly 45%. So why isn’t it a no-brainer that Grischuk is better off with a loss? What’s the downside, that led us to use hedging terminology like “it’s possible” and “could be”? First there is of course a morality aspect. We want to be completely clear that we are absolutely not advocating an intentional loss. Throwing a game is never acceptable, especially in an event of this magnitude, regardless of whether the math indicates you might benefit from a loss. However there’s also a mathematical downside. With the loss, Grischuk’s rating would drop, and he would have only a small lead over not just Kramnik but also Aronian in our projected average ratings. There’s a lot of chess left to be played in 2015, and a strong chance that Grischuk could be overtaken. The principle we discussed earlier where it’s particularly difficult to maintain a lead against multiple challengers applies here as well. With a loss in this game, Grischuk would temporarily be our projected #2, but would be an underdog to hold that spot. On the other hand, with a win, he would gain rating points and his projection in the average rating standings would be much stronger. He would have a commanding lead over those behind him, and while he would be #3 behind Nakamura it would be by a small margin. 45% of the time Naka would qualify via the Grand Prix anyway, and he’d be #2 in rating by a large margin, and the other 55% of the time he’d certainly have ample opportunity as the year progresses to surpass Nakamura in the projected rating standings. Overall, I don’t have a good algorithm to predict odds of various rating shifts through the rest of the year, so I can’t put precise predictions on how likely players are to finish top two in the ratings race. However the 10 point rating swing of a win versus a loss, carried through 7 future rating lists, will have a lot of impact. All told, I can’t prove it, but I think Grischuk is more likely to eventually find himself in the 2016 Candidates Tournament if he beats Nakamura on Sunday than if he loses on Sunday. I do suspect, though, that a draw might be worse than either, so perhaps it would be in his best interest to play aggressively and see what happens! It’s not entirely clear though. I’d love to hear other thoughts on this scenario in the comments. Either way I certainly find it to be a very interesting situation to analyze, if you happen to have an interest in game theory as I do. As we can see, if the event ended today Caruana would win the Grand Prix in dominant fashion, on the strength of a first place finish here at Khanty-Mansiysk. Nakamura would be second, 10 points ahead of Karjakin and 20 points ahead of Tomashevsky. The bad news for Nakamura and Caruana is that the event is not over yet. There are four more rounds left to play! Although Nakamura’s odds improved drastically from the 31% mark where they sat after round 6, there is still better than a 40% chance of someone else surpassing him for the #2 spot. Most likely this “someone else” would be Karjakin or Tomashevsky, but other long shots remain mathematically in contention as well. Gelfand, for instance, is predicted by our model to climb into the top two of the Grand Prix standings roughly once every 27 tries, and Jakovenko has a 1/36 shot (the same odds as rolling snake eyes on a pair of six sided dice!) And while we’re speaking of relatively unlikely scenarios, notice also that our presumed victor, Caruana, actually has a 2.3% chance of not only failing to win the Grand Prix, but in fact falling outside of the top two in the standings! In other words: the picture got a lot clearer today, and it’s easy to project Caruana and Nakamura to finish 1 and 2 in the standings and earn their Candidates Tournament berths. Nevertheless, nothing is set in stone yet, and the final four rounds still have the potential to bring major surprises. It’s not over yet! The exact scenario is of course extraordinarily unlikely (as is any one specific set of results), but it demonstrates a few key things that have to work in Nakamura’s favor in order for him to pull off second place without outscoring Tomashevsky by more than one point. First, Caruana runs away with the event while other players at the top of the standings stumble, allowing Nakamura to catch up with (and tie for) second place. This is critical because the top three places earn (or split in the case of a tie) bonus Grand Prix points. Second, the players at the bottom of the field bounce back in the final rounds, and catch up with Tomashevsky, so that he earns fewer points than he “normally” would with a 2/5 finish. Please double check my math, but I’m pretty sure that this scenario is a valid case in which Nakamura could qualify (somewhat convincingly) for the Candidates Tournament with a 2nd place finish in the Grand Prix, while NOT outscoring Tomashevsky by 1.5 (or more) points over the final five rounds at Khanty-Mansiysk. If I’m wrong, let me know, so that I can identify the flaw in my model ASAP! Update: How unlikely is this exact scenario, by the way? Extremely, but that’s true of all specific cases. Obviously, since a draw is the most likely of the three possible results in any given game, the single most likely scenario would be for every game in the final five rounds to happen. Even that, which again is the MOST LIKELY scenario, would happen less than 1 in 70 million times! With three possible results in each game (white win, draw, or black win) there are 3^30 possible permutations for how the event could finish up! With such a closely contested battle underway for the top two spots in the final Grand Prix standings – the #2 spot in particular – every decisive result can have drastic consequences on the overall field’s position. Earlier this morning (I will remind my European and Asian readers that due to time zones, games in this event begin at 3 AM my time. All results therefore occur “in the morning” to me) the first two games to finish were the quick draw between Tomashevsky and Nakamura, and Karjakin’s victory over the struggling MVL. At that point I tweeted that “ignoring the unfinished games” Karjakin was now up to a 31% chance to finish in one of those two spots and qualify for the 2016 Candidates Tournament. A significant portion of Karjakin’s 31% at that moment was due to the fact that he had temporarily tied Caruana for first place in the standings, providing increased chances that he might win the event outright. Now he doesn’t HAVE to win outright, or finish ahead of Caruana, in order to reach second place… but doing so would help, and the more likely he is to do so the higher his odds of a top two finish will be. And so it was that when Caruana wrapped up his own victory later in the morning, reclaiming sole possession of first place, Karjakin’s odds dropped severely. We now have his chances of earning a Candidates Tournament berth at only 21%. Of course for chess fans, these drastic swings are wonderful news! It may be nerve wracking for the players: a possible opportunity to play for the world title is riding on every move. For us observers, though, free from the pressure, it certainly will make the final rounds at Khanty-Mansiysk extraordinarily fun to watch. With yet another win today, you’ll see that Caruana has nearly (but not quite 100% definitively) clinched one of the two available Candidates spots. The other slot remains wide open, though, with Tomashevsky in position to win it based on the current standings, but an underdog to the “field” (Nakamura and Karjakin, mostly) to ultimately hold on. In other words, there will be no shortage of crucial and relevant games played over the final rounds. Karjakin’s opponent, on the other hand, Jobava, has been solid of late with five consecutive draws. However he is the only player in the field rated below 2700 (by a single point, mind you), and is known for his aggressive approach to chess that tends to create winning chances for both players. Our model gives him a 40% chance of victory as well! Tomashevsky would be second place in the final Grand Prix standings if Khanty-Mansiysk ended today, but his projected results over the remaining rounds are a little weaker and his form seems uneven. He’s definitely in a defensive position, trying to hold onto his lead. Tomorrow he faces another tough test: black against Anish Giri. As the ratings underdog who also holds the black pieces, our model gives Tomashevsky a 31% chance of losing (which could be crippling to his overall Grand Prix hopes), a 54% chance of holding the draw, and just a 15% chance of winning. The one upside in that equation is that if he did manage to win, defying the model’s expectations, it would significantly improve his overall standing in the projections, due to the unexpectedness of the result. Finally, our leader Caruana has white against Gelfand. For Caruana, the model offers (yet again) a 40% chance of victory, which would almost completely guarantee him first place in the overall Grand Prix standings, and bring him closer to locking up a clear first place finish here at Khanty-Mansiysk as well. On the flip side, while Gelfand is a underdog in this game, expected to win just 10% of the time, it’s worth remembering that he is not entirely eliminated from contention yet himself. He still has a 3.2% chance of qualifying for the Candidates Tournament if he manages to close out the event with a dominating run. An upset over the leader would be a nice beginning to such a run. What will happen? We’ll find out soon. Games begin in just 8 1/2 hours! Down goes Tomashevsky! Down goes Tomashevsky! With Karjakin’s marathon victory today, in a game that lasted more than seven hours, the battle for second place in the overall Grand Prix standings got a lot more interesting! Caruana is still alone in first place at Khanty-Mansiysk, and in the projected combined standings. If the tournament ended today, he would finish with 400 Grand Prix points, while Tomashevsky would just barely squeak out a second place finish with just 282 points, barely ahead of Nakamura (272) and Karjakin (270). That gap could possibly close before the event actually concludes, but right now Caruana remains a prohibitive favorite. What is far less clear is who will end up in the second spot. 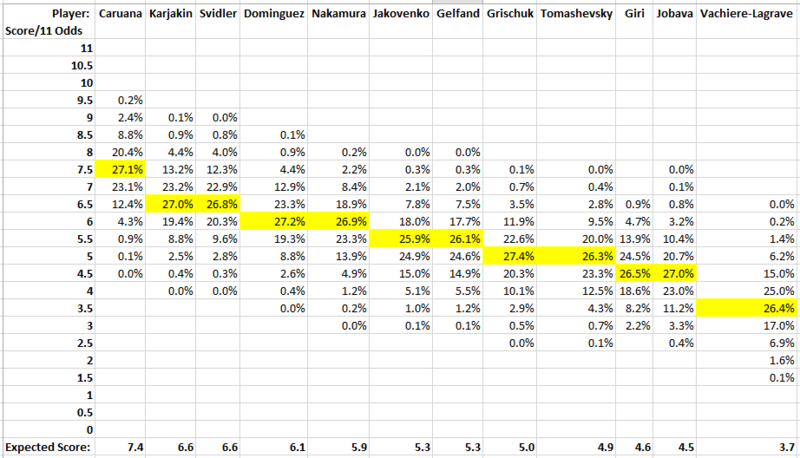 Most interesting to me is how little Nakamura gained from Tomashevsky’s loss. While Toma’s odds of qualifying dropped from 55% before the game to only 38% afterward, it is Karjakin (and Gelfand and Jakovenko) whose odds increased. Naka sits now at the same 40% chance we gave him prior to this round. This emphasizes a point we’ve hinted at before: Nakamura’s qualifying chances rely on the expectation of him winning some games (from his high rating). Ultimately he’ll have to follow through on that expectation to convert his “odds” into an actual Candidates Tournament ticket. He didn’t enter this last event with enough Grand Prix points to draw his way to the top two. Sitting in the middle of the pack, he’s likely to be overtaken by someone else. He can’t just wait for everyone around him to lose. Of course his next chance at a win, and an absolutely critical game in this battle for second place, will come tomorrow, when Tomashevsky takes up the white pieces and Nakamura sits across the board from him with black. Our model estimates that the game will be drawn 59% of the time, with a 19% chance of Tomashevsky winning and a 22% chance of Nakamura winning. Obviously any decisive result will send the winner’s qualifying odds back up over 50%, while the loser will be in far worse position than they are now. In another crucial game, Karjakin has black against Vachiere-Lagrave. Our model marks MVL as the favorite, due to the white pieces, however the model only looks at live ratings, and makes no attempt to measure “form”. Maxime is at the bottom of the standings and has not been playing well. Karjakin’s qualifying odds are up to 14% with his win today, and if he manages to take advantage of his reeling opponent and wins again tomorrow his name will definitely join the triumvirate at the top. Fabiano Caruana was already favored to finish in the top two of the final Grand Prix standings before this event began. Our model put him at 71% to earn one of the two available spots in the 2016 Candidates Tournament. Then he went and won his games in rounds 3 and 4, jumping out to sole possession of first place as we reach the first rest day. Now he’s an even more prohibitive favorite! Not only do we now have Caruana at 93% to finish in the top two of the final standings, we have him at 45% to do it in the most domininating way possible: by winning this final leg outright! Meanwhile, none of the “other contenders” and “longshots” have done anything in these first four rounds to improve their own chances of finishing in the final top two. This means that what initially looked like it might be a three-man race for two qualifying spots is now turning into a two-man race for one spot. All the drama of the final seven rounds appears likely to come from Nakamura and Tomashevsky competing for the one available berth in the Candidates Tournament that is not firmly held by Caruana. In this race for second place (in the overall standings), Tomashevsky has the edge because he entered this final leg with a strong 45 point lead in the standings. Nakamura is favored to make up some of this ground as the event progresses, because of his higher rating, but time is on Tomashevsky’s side. Every round that passes with the two still tied with each other improves Tomashevsky’s chances. In sports terms, he’s the underdog with the lead trying to run out the clock to complete the upset. And at this point we consider him a favorite to do so – but it’s close! Nakamura has drawn his first four games and needs some wins (and/or some Tomashevsky losses) to reach his goal, but there’s plenty of time for that to happen. It could easily come down to the final round. It will be very interesting to see what happens in the next few rounds. It’s possible that one of Tomashevsky or Nakamura will pull away, Caruana will continue to dominate, and everything will be almost fully decided by the second rest day. It’s also possible that Nakamura will build a small but indecisive lead (maybe half a point or so) over Tomashevsky, while Caruana falls apart and loses a few games, and Karjakin or Gelfand goes on a tear with a few wins, and all of a sudden it’s a four man race coming down to the wire! The former scenario is more likely, but the latter could still happen. From a fan’s perspective I’m rooting for the latter, it would certainly be a lot more fun! The players get tomorrow off, and then they’ll be back for round 5 and we’ll continue to see how things shake out.